It seems a Sylvan Lake thief was set on stealing anything he could get his hands on -- including a pair of adorable kittens. According to police, a rural residence south of the central Alberta town was burglarized sometime between Dec. 17 and Dec. 27, while the owners were on vacation in Halifax. Homeowner Elizabeth Hanson told Global News she returned home to find her garage door open and her car missing from its parking spot. The front door of the house had also been kicked in. 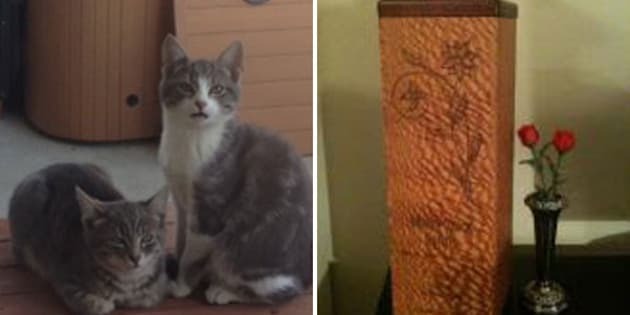 In addition to the missing kittens, Tom and Jerry, RCMP say an urn containing Hanson's mother's ashes was taken, as well as a safe that was storing 11 firearms. The engagement rings of Hanson's mother and aunt are also missing, as well as laptops, passports, two Samurai swords and important documents from her father's war service. “Those are things that, they don’t really probably have a lot of monetary value, but they do to us,” Hanson told Global. The couple reported the break-in immediately, reports CBC News, and the missing car was later found in Penhold. However, the other items remain missing. Police say the person responsible for the theft can drop off the urn at any police station or call Crime Stoppers to report its location anonymously. The urn is described as a handmade wooden box with a floral design.